The aim of the EUROWA module was to develop an international team of oiled wildlife specialists who could respond to a spill at the request of governments and could mobilise equipment at short notice. In addition to develop a database of information which could be accessed to provide centralised training and advice. The project was funded by the E.U. and ran from 2015 to December 2016. The final meeting of the project was held in Mallydam near Hastings in the U.K. It was hosted by the R.S.P.C.A. who were an integral part of the project. A practical exercise was held during the final week to put into practise the theory that had been worked on over the two years. 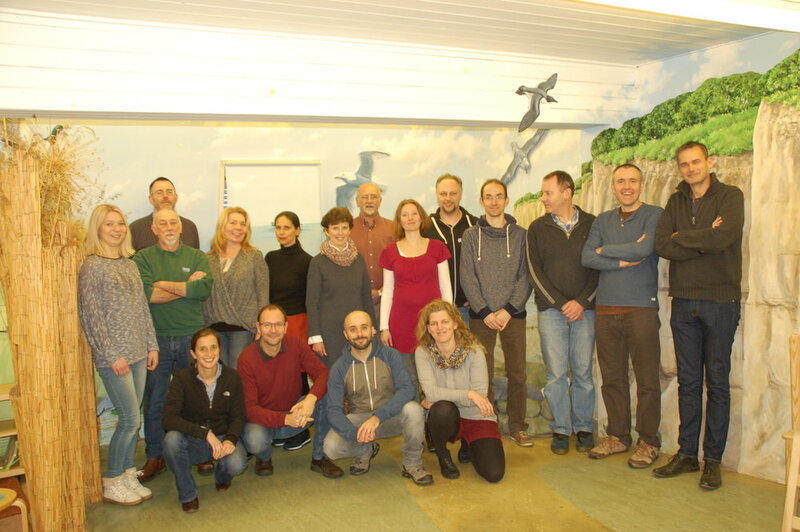 Many of the EUROWA team who gathered for the final meeting of the module. The end of a very productive project which has resulted in a huge body of work which will be of benefit in the event of a serious pollution incident. Left to right, top row; Adam Grogan, RSPCA; Tim Thomas, UK, Sasha Regmann, Germany; Middle row; Maarja Rajasaar, Estonia; Richard Thompson, RSPCA; Agni Kaldma, Estonia; Simone Jay, Holland; Pauline Beades, OWRN Ireland; Vanessa Ryan, WWF-Finland; Philip Gourlay, France; Richard Seddon, RSPCA; David Couper,RSPCA; Hugo Nijkamp, Sea-alarm,Belgium; Saskia Sessions, Sea Alarm, Belgium; Claude Velter, Belgium; Raul Hermoso, Belgium; Catherina Erdmann, Germany.